United is the debut studio album by French indie pop band Phoenix, released in 2000. Singles released from the album include "Too Young", "If I Ever Feel Better" and "Party Time". All tracks written by Phoenix. ^ Birchmeier, Jason. "United – Phoenix". AllMusic. Retrieved 10 April 2016. ^ Clarke, Betty (9 June 2000). 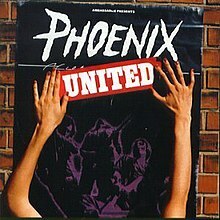 "Phoenix: United (Source Records)". The Guardian. ^ Bromley, Catherine (8 June 2000). "Phoenix: United (Source)". The List (388): 56. Retrieved 25 June 2017. ^ Martin, Piers (11 July 2000). "Phoenix – United". NME. Archived from the original on 11 July 2000. Retrieved 21 August 2017. ^ Murray, S. "Phoenix: United". Pitchfork. Archived from the original on 11 May 2006. Retrieved 10 April 2016. ^ "Phoenix: United". Q (30th anniversary special ed.) (361): 118. 2016. ^ Hunter, James (26 October 2000). "Phoenix: United". Rolling Stone. Archived from the original on 19 September 2003. Retrieved 26 June 2017. ^ Walters, Barry (October 2000). "Phoenix: United / Sunna: One Minute Science". Spin. 16 (10): 176–77. Retrieved 10 April 2016. ^ Martin, James (24 April 2004). "French Phoenix Rises". Billboard. Retrieved 17 December 2018. ^ "Lescharts.com – Phoenix – United". Hung Medien. Retrieved 29 April 2014. ^ "Norwegiancharts.com – Phoenix – United". Hung Medien. Retrieved 29 April 2014. This page was last edited on 17 December 2018, at 16:05 (UTC).